Yekaterinburg was among the very last cities to go forward with their 2018 World Cup host venue. Sure, demolition of the old stands began in spring of 2015 but it was very slow. Largely due to the fact that historical outer walls had to be left intact as a monument of local significance (and major importance in Russian sports architecture). It wasn’t until December that construction of the new stands finally began. These stands were agreed by FIFA to be well below capacity minimum of 40,000, officially estimated at 35,696 even with temporary stands added on both ends. This way it became possible to fit the entire new stadium within special limitations of the old outer walls. As we’re over 9 months since groundbreaking, permanent auditorium behind both goals is structurally ready, while both stands along the sides have the lower tier in place. Behind the stands masonry and heating works already began in order to make the stadium a feasible working place during long and cold winter. Much more impressive work is carried out well above the stands. The last of 8 primary roof supports has been delivered this week. Each 42 meters tall, these consumed a total of 16,000 cubic meters of reinforced concrete and are the base for external steel ring of the roof. Like a crown hovering nearly 50 meters above ground, the roof is growing on a daily basis as we await for the main ring to reach full circle in upcoming days. 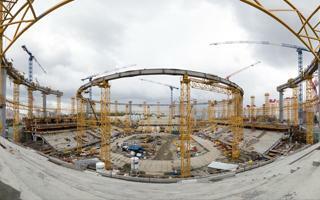 The new stadium in Yekaterinburg is expected to cost no less than RUB 12.7 billion (currently $200 million). It should be ready in late 2017, before hosting three group games during the 2018 World Cup.